Syl-Mar Management Group would like to take this opportunity to welcome you to our Website and the services that we provide, along wit h a bit of company history. 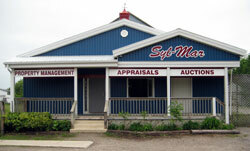 With more than twenty-five years of experience in Liquidating, Monitoring, Property Management, Appraising equipment, and managing a diverse variety of business which include Transportation, Construction, Agriculture, Manufacturing, and Retail, makes Syl-Mar Management Group the logical choice. Sign up below for our auction listings! Click on more.... for details and to view pictures.